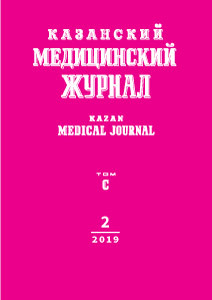 Authors: Sazanov G.V., Belokon’ O.S., Krasnov A.Y. The type and etiology of stroke in young patients are known to differ from those in elderly patients, that influences the diagnosis and treatment. Dissection of cerebral arteries holds the top position in the structure of the causes of ischemic stroke in children and young people below 45 years. Currently no clear guideline on the proper treatment of this pathology exists. The article presents the case of acute ischemic stroke in a young patient (the stroke was caused by the occlusion due to dissection of the internal carotid artery) successfully treated with radiosurgical method - stenting of the cervical part of the artery with the transition to petrous segment of the left carotid artery using combined proximal and distal protection of cerebral vessels. The control of patient's state and results of angiography and ultrasound demonstrate the favourable immediate and medium-term prognosis for the patient. dissection of internal carotid artery, stroke in a young patient, stenting, treatment. Hart R.G. Vertebral artery dissection. Neurology. 1988; 38: 987. doi: 10.1212/WNL.38.6.987. Amarenco P., Bogousslavsky J., Caplan L.R. et al. New approach to stroke subtyping: the A-S-C-O (phenotypic) classification of stroke. Cerebrovasc. Dis. 2009; 27: 502–508. doi: 10.1159/000210433. Hart R.G., Easton J.D. Dissections. Stroke. 1985; 16: 925. doi: 10.1161/01.STR.16.6.925. Adams H.P.Jr., Bendixen B.H., Kappelle L.J. et al. Classification of subtype of acute ischemic stroke. Definitions for use in a multicenter clinical trial. TOAST. Trial of Org 10 172 in Acute Stroke Treatment. Stroke. 1993; 24: 35–41. doi: 10.1161/01.STR.24.1.35. Bassetti C., Carruzzo A., Sturzenegger M. et al. Recurrence of cervical artery dissection: A prospective study of 81 patients. Stroke. 1996; 27: 1804–1807. doi: 10.1161/01.STR.27.10.1804. DeBray J.M., Penisson-Besnier I., Emile J. Extracranial and intracranial vertebrobasilar dissections: diagnosis and prognosis. J. Neurol. Neurosurg. Psychiatry. 1997; 63: 46–51. doi: 10.1136/jnnp.63.1.46. Cerrato P., Grasso M., Imperiale D. et al. Stroke in young patients: etiopathogenesis and risk factors in diffe­rent age classes. Cerebrovasc. Dis. 2004; 18: 154–159. doi: 10.1159/000079735. Tripathi M., Santosh V., Nagaraj D. et al. Stroke in a young man with fibromuscular dysplasia of the cranial vessels with anticardiolipin antibodies: a case report. Neurol. Sci. 2001; 22 (1): 31–35. doi: 10.1007/s100720170034. Yoshimoto Y., Wakai S. Unruptured intracranial vertebral artery dissection: Clinical course and serial radiographic imagings. Stroke. 1997; 28: 370. doi: 10.1161/01.STR.28.2.370. Mas J.L., Bousser M.G., Hasboun D. et al. Extracranial vertebral artery dissections: a review of 13 cases. Stroke. 1987; 18: 1037–1047. doi: 10.1161/01.STR.18.6.1037. Silbert P.L., Mokri B., Schievink W.I. Headache and neck pain in spontaneous internal carotid and vertebral artery dissection. Neurology. 1995; 45: 1517–1522. doi: 10.1212/WNL.45.8.1517. Hegde V., Coutinho C.M., Mitchell J.D. Dissection of the intracranial internal carotid artery producing isolated oculomotor nerve palsy with sparing of pupil. Acta. Neurol. Scand. 2002; 105: 330–332. doi: 10.1034/j.1600-0404.2002.1c259.x. Baumgartner R.W., Bogousslavsky J. Clinical manifestations of carotid dissection. In: Bawngartner R.W., Bogousslavsky J., Caso V., Paciaroni M. (eds.). Handbook on cerebral artery dissection. Front. Neurol. Neurosci. Basel: Karger. 2005; 20: 70–76. doi: 10.1159/000088151. Rao A.S., Makaroun M.S., Marone L.K. et al. Long-term outcomes of internal carotid artery dissection. J. Vasc. Surg. 2011; 54: 370–374. doi: 10.1016/j.jvs.2011.02.059. Crönlein M., Sandmann G.H., Beirer M. et al. Traumatic bilateral carotid artery dissection following severe blunt trauma: a case report on the difficulties in diagnosis and therapy of an often overlooked life-threatening injury. Eur. J. Med. Res. 2015; 20: 62. doi: 10.1186/s40001-015-0153-1. Zinkstok S.M., Vergouwen M.D., Engelter S.T. et al. Safety and functional outcome of thrombolysis in dissection-related ischemic stroke: a meta-analysis of individual patient data. Stroke. 2011; 42: 2515–2520. doi: 10.1161/STROKEAHA.111.617282. Patel R.R., Adam R., Maldjian C. et al. Cervical carotid artery dissection: current review of diagnosis and treatment. Cardiol. Rev. 2012; 20: 145–152. doi: 10.1097/CRD.0b013e318247cd15. Sturzenegger M., Mattle H.P., Rivoir A. et al. Ultrasound findings in spontaneous extracranial vertebral artery dissection. Stroke. 1993; 24: 1910–1921. doi: 10.1161/01.STR.24.12.1910. Sturzenegger M., Mattle H.P., Rivoir A., et al. Ultrasound findings in carotid artery dissection: analysis of 43 patients. Neurology. 1995; 45: 691–698. doi: 10.1212/WNL.45.4.691. © 2019 Sazanov G.V., Belokon’ O.S., Krasnov A.Y.